In its latest “Global Economic Prospects” report, the World Bank predicts 2.7 percent growth for 2017, up from 2.3 percent growth in 2016. In particular, it predicts improvements in the emerging markets, and if the United States succeeds in enacting pro-growth fiscal policies, it “could lead to stronger-than-expected activity and thus represent a substantial upside risk to the outlook.” With that said, the pace of the global economic expansion remains subpar, even with progress. In this release, current projections for growth in 2017 in the United States is 2.2 percent, up from 1.6 percent in 2016. (My forecast for 2017 is 2.6 percent, with 1.5 percent growth in manufacturing production.) Among other highlights, the World Bank forecasts growth in the emerging markets of 4.2 percent in 2017, with the Eurozone and China up 1.5 percent and 6.5 percent, respectively. The strongest manufacturing growth among our top trading partners was in the Netherlands, Taiwan, the United Kingdom, Germany and Australia. Of those markets, Taiwan experienced its fastest growth in manufacturing activity since April 2011, and the United Kingdom continued to brush off Brexit uncertainties, with its PMI rising to its highest point since June 2014. Among other things, manufacturers in the United Kingdom have benefited from a cheaper pound, with decent export growth. It was not alone, as Eurozone manufacturing activity accelerated in December to its highest level since April 2011, boosted by better data on new orders and output. Chinese manufacturers also ended 2016 on a high note. The Caixin China General Manufacturing PMI increased at its fastest pace since January 2011. New orders and output increased, with production growth at its highest level in nearly six years. With that said, exports were stagnant for the month after contracting for much of the past year, and employment continued to lag behind. Employment has now been negative for more than three years. We will get several key data points on January 19, including fourth quarter real GDP, which is expected to come in around 6.7 percent year-over-year. If so, it would match the rate in both the second and third quarters. Meanwhile, there was mixed news in North America. Canadian manufacturing continued to rebound from autumn softness, with activity at a five-month high. That represents progress after activity nearly stalled in September. More importantly, activity has now expanded for nine consecutive months, and the pace of new orders was the fastest in two years. The national headline number was boosted by improvements in Alberta and British Columbia as well as Ontario, with the former benefiting from higher energy commodity prices, expanding at two-year highs. At the same time, Mexican manufacturing activity slowed to a crawl in December, expanding at its slowest rate since October 2013. More positively, exports picked up slightly in December, likely benefiting from a significantly weaker Mexican peso. Along those lines, the peso depreciated (and the U.S. dollar appreciated) nearly 20 percent in 2016, with 11.8 percent of that shift occurring after President-elect Donald Trump’s election on November 8. As the United States prepares for a transition to the new Trump administration, trade continues to be one of the key issues under discussion. From new trade appointees to a relook at the North American Free Trade Agreement (NAFTA) and improved trade enforcement, activity is accelerating to prepare for the new administration. Key NAM priorities relating to the Export-Import (Ex-Im) Bank, the Miscellaneous Tariff Bill (MTB), export controls and trade relations and potential negotiations with key countries will also figure prominently in the weeks and months ahead. Global manufacturing activity expanded at its fastest pace since February 2014. The J.P. Morgan Global Manufacturing PMI increased from 52.1 in November to 52.7 in December, its highest level in nearly three years. It represented notable progress after essentially stagnating as recently as May. The higher headline number in December stemmed from stronger growth in activity across the board, including new orders (up from 53.1 to 53.8), output (up from 53.4 to 53.8), exports (up from 51.3 to 51.4) and employment (up from 50.8 to 51.4). The employment index, which expanded for the fifth time in the past six months, grew at its quickest rate since March 2014. Twelve of the top-15 markets for U.S.-manufactured goods exports experienced growth in their manufacturing sectors in December, up from 11 in November and just seven in August. (There is no manufacturing PMI for comparison purposes for Belgium, which is our 10th-largest trading partner.) That meant that the number of countries contracting in their manufacturing sectors whittled down from three to two in December, with Hong Kong expanding for the first time since February 2015 (up from 49.5 to 50.3). Brazil (down from 46.2 to 45.2) and South Korea (up from 48.0 to 49.4) were the lone two nations with contracting activity levels in the latest data, with both continuing to struggle, much as they have for the past two years. The strongest manufacturing growth among our top trading partners was in the Netherlands (up from 57.0 to 57.3), Taiwan (up from 54.7 to 56.2), the United Kingdom (up from 53.6 to 56.1), Germany (up from 54.3 to 55.6) and Australia (up from 54.2 to 55.4). Of those markets, two were notable. Taiwan experienced its fastest growth in manufacturing activity since April 2011, and the United Kingdom continued to brush off Brexit uncertainties, with its PMI rising to its highest point since June 2014. Among other things, manufacturers in the United Kingdom have benefited from a cheaper pound, with decent export growth (up from 54.0 to 55.7). Eurozone manufacturing activity accelerated in December to its highest level since April 2011. The Markit Eurozone Manufacturing PMI increased from 53.7 to 54.9, boosted by better data on new orders (up from 54.4 to 55.9) and output (up from 54.1 to 56.1). Exports (up from 54.1 to 54.8) and employment (up from 53.4 to 53.5) also improved in December, with both experiencing modest growth. Looking at the country-by-country figures, a number of Eurozone markets experienced multiyear highs, including Austria (up from 55.4 to 56.3), France (up from 51.7 to 53.5), Germany (up from 54.3 to 55.6), Ireland (up from 53.7 to 55.7), the Netherlands (up from 57.0 to 57.3) and the United Kingdom (up from 53.6 to 56.1), with Italy (up from 52.2 to 53.2) and Spain (up from 54.5 to 55.3) also ending the year on a stronger note. In contrast to those markets, Greece contracted for the fourth straight month and for the ninth time in 2016 (up from 48.3 to 49.3). Real GDP grew 0.3 percent in the third quarter, mirroring the pace in the second quarter. That translated to 1.7 percent growth year-over-year. We will get November industrial production data on January 12, which we hope will improve upon the decline in October. On a year-over-year basis, industrial output grew by a relatively sluggish 0.6 percent in the Eurozone. For its part, retail sales pulled back again in November, down 0.4 percent, but with 2.3 percent growth over the past 12 months. The labor market was more encouraging, with the unemployment rate in November matching the 9.8 percent pace in October, which was the lowest level since July 2009. Meanwhile, the European Central Bank has worried about deflationary pressures over much of the past year, but the annual inflation rate rose to 1.1 percent in December, its highest level since September 2013. Chinese manufacturers ended 2016 on a high note. The Caixin China General Manufacturing PMI increased from 50.9 in November to 51.9 in December, its fastest pace since January 2011. New orders (up from 51.9 to 53.1) and output (up from 52.7 to 53.7) increased, with production growth at its highest level in nearly six years. With that said, exports were stagnant for the month after contracting for much of the past year (up from 49.9 to 50.0), and employment continued to lag behind (down from 48.1 to 48.0). Employment has now been negative for more than three years. Meanwhile, the official manufacturing PMI data from the National Bureau of Statistics of China slipped from 51.7 in November, its fastest pace since July 2014, to 51.4 in December. Still, it was the fifth consecutive monthly expansion, signifying improvement in the sector, especially for larger firms. At the same time, small and medium-sized enterprises continued to struggle. We will get several key data points on January 19, including fourth quarter real GDP, which is expected to come in around 6.7 percent year-over-year. If so, it would match the rate in both the second and third quarters. On that day, we will also receive updates on several measures of activity for December, each of which had decelerated in prior releases but have appeared to stabilize more recently, including fixed asset investment (unchanged at 8.3 percent year-over-year), industrial production (up from 6.1 percent to 6.2 percent) and retail sales (up from 10.0 percent to 10.8 percent). The acceleration in activity has also been seen in industrial profits, which have improved from a decline of 1.9 percent year-over-year in November 2015 to 9.4 percent in the latest data. Emerging markets have also improved, expanding for the sixth straight month. The Markit Emerging Markets Manufacturing Index increased from 50.8 to 51.2, its fastest pace since July 2014. In December, new orders (up from 51.4 to 52.0) and output (up from 52.1 to 52.4) both expanded modestly, mostly mirroring the headline figure in terms of performance and recent progress. In addition, exports returned to positive territory for the first time in 13 months, albeit just barely (up from 49.9 to 50.1). On the negative side, hiring continued to contract (down from 49.2 to 49.0), even if the data have stabilized from sharper declines earlier in the year. Meanwhile, the forward-looking composite index for future output pulled back somewhat in December but remained mostly encouraging regarding the next six months (down from 59.9 to 59.2). The country-by-country data were mixed. China (up from 50.9 to 51.9), Poland (up from 51.9 to 54.3), Russia (up from 53.6 to 53.7), South Africa (up from 50.8 to 51.6), Taiwan (up from 54.7 to 56.2) and the United Arab Emirates (up from 54.2 to 55.0) achieved multiyear highs on stronger growth. There were also a number of countries that ended 2016 with stronger activity, including the Czech Republic (up from 52.2 to 53.8), Kenya (up from 53.3 to 54.1) and Saudi Arabia (up from 55.0 to 55.5). At the same time, the Philippines (down from 56.3 to 55.7) and Vietnam (down from 54.0 to 52.4) both eased somewhat in December but continued to expand at a decent pace overall. As noted earlier, Hong Kong expanded for the first time since February 2015 (up from 49.5 to 50.3). In contrast to those economies, India (down from 52.3 to 49.6) contracted for the first time in 12 months on a national cash crunch, dampening activity and overall confidence, and Myanmar fell back into negative territory in December, contracting for the sixth time in the past seven months (down from 50.2 to 49.4). There were also several emerging markets that have remained mired in contraction, including Brazil (down from 46.2 to 45.2), Egypt (up from 41.8 to 42.8), Indonesia (down from 49.7 to 49.0), Lebanon (up from 46.9 to 47.0), Malaysia (unchanged at 47.1), Nigeria (up from 47.7 to 48.1), South Korea (up from 48.0 to 49.4) and Turkey (down from 48.8 to 47.7). Canadian manufacturing continued to rebound from autumn softness. The Markit Canada Manufacturing PMI increased from 51.5 to 51.8, a five-month high. That represents progress after activity nearly stalled in September (50.3), with three consecutive improvements in the headline number since then. Perhaps more importantly, activity has now expanded for nine consecutive months. In December, there were stronger data for new orders (up from 52.2 to 52.6), output (up from 51.0 to 51.6) and exports (up from 50.6 to 50.9). The pace of new orders was the fastest in two years. At the same time, hiring eased a little but remained positive (down from 52.1 to 51.2). The regional data were mostly higher. The national headline number was boosted by improvements in Alberta and British Columbia (up from 53.4 to 54.7) and Ontario (up from 50.4 to 51.4), with the former expanding at its fastest rate in two years. While manufacturing activity in the rest of Canada appears to have stabilized in December (up from 49.2 to 50.0), sentiment in Ontario drifted further in contraction territory (down from 49.9 to 48.0). Real GDP grew 0.9 percent in the third quarter, bouncing back from the 0.3 percent decrease in the second quarter. At the annual rate, Canada’s economy expanded 3.5 percent, its fastest pace since the second quarter of 2014. Nonetheless, manufacturing output declined 2.0 percent in October with both durable and nondurable goods activity lower for the month. In contrast, retail sales rose 1.1 percent in October, extending the 0.6 percent gain in September. Meanwhile, the unemployment rate ticked up from 6.8 percent in November to 6.9 percent in December, but manufacturers added 3,600 net workers for the month. Yet, the sector has lost 53,400 employees year-over-year. Mexican manufacturing activity slowed to a crawl in December. The Markit Mexico Manufacturing PMI declined from 51.1 to 50.2, its slowest pace since October 2013. Contracting levels of output (down from 50.9 to 49.5) helped to pull the headline number lower, with new orders (down from 52.4 to 50.4) and employment (down from 51.7 to 51.5) also decelerating. More positively, exports picked up slightly in December (up from 51.5 to 51.8), likely benefiting from a significantly weaker peso. 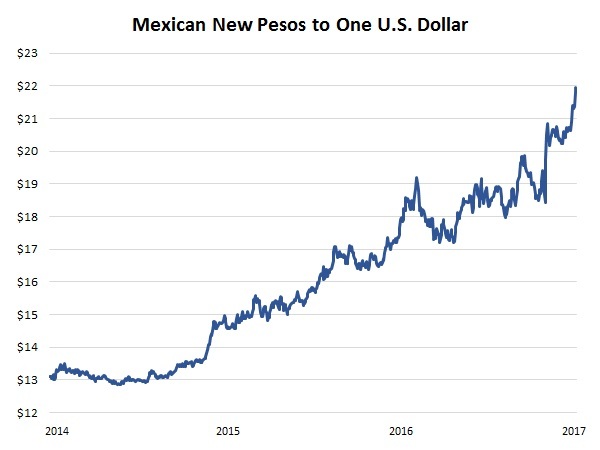 Along those lines, the peso depreciated (and the U.S. dollar appreciated) nearly 20 percent in 2016, with 11.8 percent of that shift occurring after President-elect Trump’s election on November 8. Real GDP increased 2.0 percent year-over-year in the third quarter, down from 2.6 percent in the second quarter. As such, the Mexican economy continued to underperform. Likewise, industrial production rebounded in November, up 1.3 percent year-over-year, from a contraction of 1.2 percent in October. Mining weaknesses pulled the headline number lower, with manufacturing output up 4.3 percent year-over-year. However, that pace remained less than desired. U.S.-manufactured goods exports continue to struggle. Using non-seasonally adjusted data, U.S.-manufactured goods exports totaled $961.91 billion year to date in November, down 6.1 percent from $1,024.74 billion in November 2015. Moreover, exports were lower to the top-six markets for U.S.-manufactured goods, including Canada (down from $258.90 billion to $245.62 billion), Mexico (down from $217.23 billion to $211.85 billion), China (down from $105.95 billion to $104.15 billion), Japan (down from $57.68 billion to $57.60 billion), the United Kingdom (down from $51.80 billion to $51.08 billion) and Germany (down from $45.97 billion to $45.00 billion). Note that most of those figures are down only slightly, however, with the exception of Canada. That suggests some progress from prior reports as those gaps have narrowed. The U.S. trade deficit rose to a nine-month high in November. The trade deficit rose to a nine-month high, up from $42.36 billion in October to $45.24 billion in November. For the year as a whole, the monthly data were quite volatile, ranging from $36.17 billion in September to $45.26 billion in February. In 2016, the trade deficit averaged $41.27 billion, which was not far from the $41.70 billion average in 2015. The November increase stemmed from reduced goods exports (down from $123.07 billion to $122.35 billion) that corresponded with higher goods imports (up from $186.30 billion to $188.98 billion). The goods imports pace was the largest since August 2015. Looking more closely at the underlying data, goods exports were somewhat lower but also mixed. On the positive side, exports were higher for industrial supplies and materials (up $1.46 billion) and consumer goods (up $481 million). However, those increases were offset by declines for capital goods (down $1.77 billion), other goods (down $691 million), automotive vehicles and parts (down $300 million) and foods, feeds and beverages (down $195 million). At the same time, the higher goods imports figure was buoyed by a large increase in industrial supplies and materials (up $2.25 billion). Incoming Trump administration is filling key trade spots. In December and January, President-elect Donald Trump named several individuals for top trade positions in the incoming administration, including Wilbur Ross as nominee for secretary of commerce, Ambassador Robert Lighthizer as U.S. Trade Representative and Peter Navarro as the head of the soon-to-be-created National Trade Council. Statements from NAM President and CEO Jay Timmons on each of these selections can be found here. The NAM remains in close contact with the transition team and will seek to provide opportunities for NAM member engagement with these and other new trade officials in the weeks ahead. Discussions on NAFTA expected this year. Given statements on the campaign trail, President-elect Trump’s 100-day “Contract with the American Voter” and discussions with key officials, there is a strong expectation that a review and potential renegotiation of, or possibly withdrawal from, NAFTA will be part of the Trump administration’s initial area of focus. The NAM has been reaching out to key transition team members, meeting with our members and holding discussions with other interested stakeholders on the path forward. The NAM looks forward to identifying concerns with the existing NAFTA framework and potential ways to improve it, while ensuring that the approximately 2 million manufacturing workers and thousands of manufacturers in the United States that rely on a strong North American commercial environment are not harmed by any changes to be made. For more information and to become involved in the NAM’s work in this area, contact NAM Vice President of International Economic Affairs Linda Dempsey and NAM Director of International Trade Policy Ken Monahan. U.S. International Trade Commission (ITC) is seeking public comments on MTB petitions. On January 11, the U.S. ITC began accepting public comments on the more than 2,500 MTB petitions submitted through its web portal late last year. The comment period ends at 5:15 p.m. EST on Friday, February 24. The public may object to, support or take no position on a filed petition, and petitioners may provide additional information beyond what was included in petitions filed last year (but they cannot correct or amend a submitted petition). For additional details, please review the new ITC guide, “Before You File a Comment: How to Prepare for Filing a Miscellaneous Tariff Bill Comment” and the Federal Register notice. If you have any questions about the MTB and/or the MTB process, contact NAM Director of International Trade Policy Ken Monahan. Updates published to export control rules for satellites and spacecraft. On January 10, the State and Commerce Departments published updates—in response to public comments and further U.S. government review—to the interim final rules published on May 13, 2014, that revised U.S. Munitions List (USML) Category XV (Spacecraft and Related Articles) and related controls under the Export Administration Regulations. The final rule from the Commerce Department includes changes to address the movement of additional spacecraft and related items from the USML to the Commerce Control List (CCL), as a result of changes in aperture size for spacecraft that warrant International Traffic in Arms Regulations (ITAR) control, and changes to address the movement of the James Webb Space Telescope from the USML to the CCL. For more on the NAM’s work on export controls, contact NAM Director of Trade Facilitation Policy Lauren Wilk. U.S. government releases intellectual property (IP) strategic plan, report on "Notorious Markets" for counterfeiting and piracy. The U.S. government in December released a pair of reports on top IP issues facing manufacturers. On December 12, the Office of the U.S. Intellectual Property Enforcement Coordinator (IPEC) released a new three-year strategic plan for IP enforcement, outlining actions taken by federal agencies and companies to protect patents, trademarks, copyrights and trade secrets as well as future approaches and actions to strengthen that protection through 2019. The report, which expands significantly on IPEC’s 2013 plan, includes statistics proving the importance of IP for the high-paying jobs in sectors such as manufacturing and recommendations to boost efforts to address online counterfeiting and piracy, tackle IP theft through customs and trade channels and improve interagency coordination. On December 21, the USTR released its 2016 “Notorious Markets” report, an annual publication that identifies priority online and physical marketplaces that facilitate or directly engage in counterfeiting or piracy. This year’s report highlights nearly 40 markets around the world, including well-known marketplaces in countries such as China, Russia, India, Indonesia and Switzerland. For more on the NAM’s work on IP rights, contact NAM Director of International Business Policy Ryan Ong. World Trade Organization (WTO) Trade Facilitation Agreement (TFA) nears entry into force. At last count, 106 countries had ratified the WTO TFA, leaving only four more ratifications to bring the TFA into force. Upon entry into force, all developed country members of the WTO will start applying all of the substantive provisions of the TFA from the date it takes effect. Developing countries and least developed countries will also begin applying those substantive provisions of the TFA that they have committed to implement from the date of entry into force, as set out in the Category A notifications, which 91 members have submitted to date. Later this month, the United Nations Conference on Trade and Development is hosting the first International Forum for National Trade Facilitation Committees. The TFA requires all WTO members to have a national committee to oversee its implementation. Last year, more than 30 business associations joined the NAM in urging countries to ratify the TFA. The NAM will continue to monitor TFA implementation, including the activities of the Global Alliance for Trade Facilitation on the ground in Colombia, Ghana, Kenya and Vietnam. To learn more about this issue, contact NAM Director of Trade Facilitation Policy Lauren Wilk. Annual report for Ex-Im Bank highlights support for exports and jobs, but demonstrates impact of lack of board quorum. Earlier this month, the Ex-Im Bank released its fiscal 2016 annual report. Although the Ex-Im Bank remains unable to process certain transactions without a quorum for its board of directors, undermining the ability of U.S. exporters to compete in a tough global marketplace, the agency was able to support $8 billion in U.S. exports in fiscal 2016. In turn, those exports supported about 52,000 U.S. jobs. Small businesses, such as Thrush Aircraft, which was featured in the annual report, represent nearly 90 percent of Ex-Im Bank’s authorizations. Notably, 113,000 fewer jobs were supported in 2016, compared to 2014, the last full year when the Ex-Im Bank was fully functioning. Visit www.nam.org/exim to learn more and www.exportersforexim.org to use the updated Call to Action to contact your members of Congress. To learn more about the NAM’s advocacy efforts on this issue, contact NAM Director of Trade Facilitation Policy Lauren Wilk. The USTR criticizes China for lack of progress on WTO commitments in annual implementation report. In January, the Office of the U.S. Trade Representative (USTR) criticized the Chinese government for “interventionist policies and practices” as well as the “large role of state-owned enterprises (SOEs) and other national champions” in its annual report to Congress on China’s compliance with its WTO commitments. The report examines a broad swath of trading issues for how China complies with the commitments that it agreed to when joining the WTO in 2001, including customs and import regulations; export regulation; internal trade policies, such as standards and technical regulations, taxation and SOEs; investment; agriculture; and IP rights. In the report, the USTR also states that China must implement promised reforms and alter the role of the state in planning the economy, including reforming SOEs and removing market access barriers for foreign products to address its current economic challenges. The NAM provided detailed comments to the USTR for this report, highlighting a broad range of priority issues, including policies that fuel massive overcapacity in various sectors and limit exports, localization policies, such as China’s “Made in China 2025” plan, weak IP rights protection in China and ongoing customs and trade facilitation issues. For more on the NAM’s work on China, contact NAM Director of International Business Policy Ryan Ong. Presidential advisory group report emphasizes the need for action to address challenges facing semiconductors. The President’s Council of Advisors on Science and Technology, a presidentially appointed advisory group of scientists and engineers, released a new report on January 6 on innovation, competitiveness and security in the semiconductor industry. The report specifically notes a concerted push by other governments, particularly China, to use industrial policies and government funding to undermine the competitiveness of the U.S. semiconductor industry. While the report emphasized the need for the industry to accelerate the pace of innovation, it also calls on the U.S. government to influence relevant Chinese semiconductor policies, strengthen investment security and export controls and use bilateral and multilateral forums to address Chinese policies that may violate its international commitments. USTR identifies concerns in numerous areas of Russia's trade regime in annual WTO implementation report. In December, USTR released its “2016 Report on the Implementation and Enforcement of Russia’s WTO Commitments.” The report underscores U.S. concerns about Russia’s activities that have negative impacts on manufacturing in the United States, including Russia’s application of non-tariff measures (e.g., import valuation and burdensome import licensing requirements); use of sanitary and phytosanitary measures; technical barriers to trade (e.g.,as they relate to the alcohol, toy, processed food, pharmaceutical and medical devices industries); industrial policies, including Russia’s use of subsidies and price controls in the titanium and natural gas sectors; the growing use of domestic content requirements for purchases by state-owned and state-controlled enterprises; preference programs for government purchases of domestically produced products (e.g.,automobiles, satellite navigation systems, software, medical devices and pharmaceutical goods); and concerns about the protection and enforcement of IP rights. WTO concludes trade policy review of the United States. On December 19 and 21 in Geneva, WTO members conducted the 13th review of the trade policies and practices of the United States. The WTO secretariat’s report on the United States, released in November, details the U.S. economic environment, U.S. trade and investment regime, U.S. trade policies and practices by measure and U.S. trade policies by sector. A report submitted by the United States details our nation’s economic and trade environment, including U.S. trade policy developments since the last review in 2014. WTO members’ questions and answers from the review will be posted on the WTO’s website in the coming weeks. Commerce Department announces enforcement advisory council. On January 9, the Commerce Department announced the establishment of an Advisory Council on Trade Enforcement and Compliance but set no deadline for formally establishing the advisory panel. Commerce said it will publish a separate notice later this month soliciting nominations. The 20-member council is being established under the authorities granted to government agencies by the Federal Advisory Committee Act. With the transition from the Obama administration to the Trump administration, however, it is not clear how or whether the new administration will proceed with this council. The U.S. Commercial Service will host a webinar on business opportunities in the Dominican Republic for U.S. companies. Participants will gain significant market insight by identifying export opportunities and best prospects in the Dominican Republic’s market. For more information, click here. The U.S. Commercial Service and the Arizona District Export Council will host a conference in Scottsdale, Ariz., to bring together trade experts, industry professionals and U.S. commercial diplomats via panels, one-on-one meetings and extensive networking to address opportunities and demand for advanced manufacturing. Participants will gain knowledge about the critical next steps needed to transform market potential to market success in markets of interest across the world. For more information, click here. Contact Kent Campbell for more information. Application deadline: January 27. March 26–31 Contact Diego Gattesco or Jessica Gordon for more information. Application deadline: January 31. Hannover Messe will host its annual trade show April 24–28, offering international exposure for U.S. companies, institutions and economic development organizations participating as exhibitors in the U.S. delegation. Hannover Messe is the world’s largest industrial trade show, combined with an investment summit. Industry pavilions are available for digital factory, energy, industrial automation, industrial supply, motion/drive/automation, ComVac and research and technology, connecting exhibitors to potential customers across relevant industry sectors. For more information, click here. For a listing of other upcoming Commerce Department trade missions, click here.